Hope for the future starts with today. The Oasis Botanical Sanctuary is the spot. The BoogieMen , The Drum Thieves and Revolution Groove are bringing the jams. 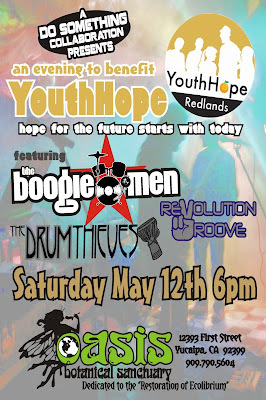 Bring your support as we raise money to help local teens who are living on the streets. These kids need help and Youth Hope provides many resources, starting with the basics of food and clothing. There will be raffle prizes and silent auctions. All money (100%) raised will go directly to Youth Hope to help build confidence and promote self-sufficiency for homeless and runaway youth by providing trust, hope, support and education. No one is a lost cause! Come have a great time and give to a great local cause in the amazing environment that is the Oasis. Now is the time to make a difference!